9:00 am-5:00 pm, Monday through Saturday, 1:00 pm-5:00 pm on Sundays, April 1-October 31. Winter schedule: November 1-March 31, by appointment when curators are available. group of Kentucky's early settlers built Cane Ridge Meeting House in 1791. Nestled among Kentucky's rolling hills and gracious horse farms, Cane Ridge Meeting House is located on State Highway 537 in Bourbon County, Kentucky. It is believed to be the largest one-room log structure standing in North America. It is the symbol of the late 18th and early 19th Century Western Great Revival. The Cane Ridge Presbyterian congregation with its pastor Barton Warren Stone were hosts for the event that took place here in August 1801. Following the advice of pioneer explorer and guide Daniel Boone, a group of Scots-Irish Presbyterians from North Carolina settled in the area in 1790. At the same time that they were building homes and establishing livelihoods, they cut and hewed blue ash logs for the Meeting House's walls and oak and chestnut trees for beams and roof supports. he young Presbyterian minister, Barton Warren Stone (1772-1844), arrived on the western frontier to pastor at Cane Ridge in 1796. By the end of the century, Presbyterians in Kentucky, southern Ohio, and northern Tennessee traveled to each other's sacramental communion services which typically began on Friday or Saturday and continued through Monday. Joining them in increasing numbers after a meeting at Red River in Logan County in June 1801 were Methodists and Baptists as well as the unchurched. 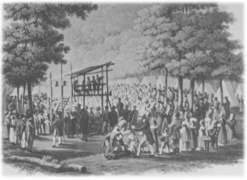 The Revival of August 1801 at Cane Ridge was the climactic event of the Western Great Revival. It was estimated by military personnel that some 20,000 to 30,000 persons of all ages, representing various cultures and economic levels traveled on foot and on horseback, many bringing wagons with tents and camping provisions. Because of the numbers of people attending and the length of the meeting, Cane Ridge has become the metaphor of the Great Revival. Historical accounts recall the contagious fervor which characterized the meetings that continued day and night. Descriptions abound of individuals, taken by great emotion, falling to the ground, crying aloud in prayer and song, and rising to exhort and assist others in their responses to the moment. Worship continued well into the week following the serving of Communion on Sunday, in fact, until provisions for humans and horses ran out. The sacramental gatherings of the Presbyterians, already undergoing transformation by the time of the August 1801 Cane Ridge Revival, contributed to the growing camp meeting revivals. Participation by Methodists added an emotional evangelical quality that Presbyterians had previously tried to hold in check. Baptists attended, however, many were in a parallel meeting of the South Elkhorn Baptist Association. n 1804, a small group of Presbyterian ministers from Kentucky and Ohio, including Stone, penned and signed a document, "The Last Will and Testament of the Springfield Presbytery", at Cane Ridge that resulted in the birth of a movement seeking unity among Christians along non-sectarian lines. They would call themselves simply "Christians. The Christian Church (Disciples of Christ), the Churches of Christ (non-instrumental), and the Christian Churches (independent) of the Stone-Campbell movement trace their origins here. This movement is often noted as the first one indigenous to American soil. ane Ridge Christian Church congregation continued until 1921 when the declining congregation disbanded. The historic old building stood in its place awaiting recognition of its proper place in cultural and religious history. The effect of the charismatic leadership of Alexander Campbell dominated the Stone-Campbell movement for many years after his death in 1866. In the 1930s the ministry of Barton Warren Stone was discovered anew. His role in the Cane Ridge Revival and the development of the Christians of the West sparked the desire to restore the Meeting House to its original appearance. This led to the organization by the Disciples of Christ of the Cane Ridge Preservation Project. After the Historic American Buildings Survey visited Cane Ridge in 1934, it was recognized by the US Dept. of the Interior as a building of national significance deemed worthy of saving. To protect it from weather, vermin, and woodpeckers, in 1957 a golden limestone superstructure around the log church was dedicated. In 2006 the Cane Ridge Preservation Project was renamed The Cane Ridge Shrine, Inc.
Cane Ridge Meeting House. All Rights Reserved.